Assigning Bunks to Available Activities indicates that the group of campers within the Bunk will be participating in the selected Activity during the assigned Period. The Available Activity and Bunk count indicator (# of Assigned Bunks / Maximum Available Slots) for the current Day. 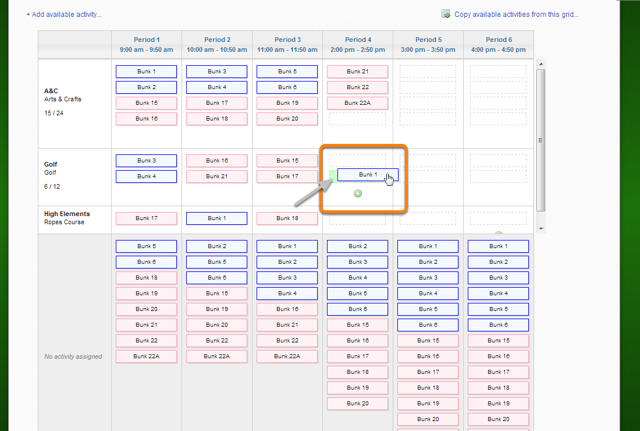 Bunks that are currently assigned to an Available Activity Slot for a Period appear in the same row as the Available Activity. 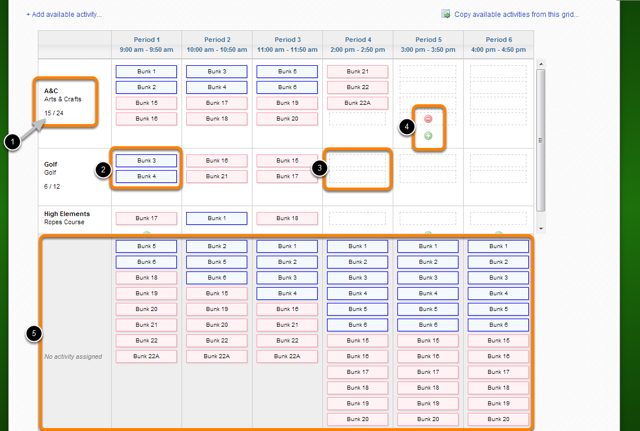 Available Activity Slots that have not yet been assigned to a Bunk appear as rectangles with dashed borders. You may add or remove an Available Activity Slot to a Period by clicking on the green or red circles, respectively. The "No activity assigned" orphanage indicates Bunks that have not yet been assigned to an Activity for each Period within the current Day. In order to assign a Bunk to an Available Activity Slot, "Drag & Drop" the Bunk from the "No activity assigned" area to an Available Activity Slot. When hovering over the Slot, the background of the Slot will turn Green to indicate that you may assign the Bunk here.